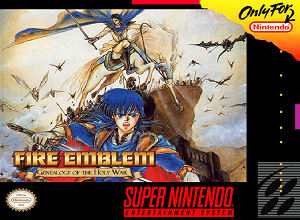 Cheats, Tips, Tricks, Walkthroughs and Secrets for Fire Emblem Seisen No Keifu on the Super Nintendo (SNES) We also have PRO Action replay and game genie codes. Access The Arena Unlimited Times – In chapter 7, after you defeat all of the enemies in the arena it will say that you have no one left to fight. However, if you leave your home castle and go to one of the castles you conquered, view the message that says there is no one left to fight at that castle, and then go back to your home castle, you can access the arena again. This way, you can easily get most of the second generation to level 30 in the first chapter you have them. Lackche with Balmunk – First, you need Lackche to have major Odo blood by pairing with Holyn, or she will not be able to wield it. To start the glitch, equip Shanon with the Balmunk, and get killed. Have Corple use the Valkyrie Staff, and press L or R on Shanon. Shanon’s Balmunk should change to an Iron Lance. Now Save your game, and reset. Load your game back up, and go to the Shop in your castle. Balmunk should be for sale. Now have Lackche buy it. Normally she wouldn’t be able to buy it, but if you did the above steps it should work. If you are lucky enough to own an action replay you can use the below codes in Fire Emblem Seisen No Keifu snes cheats on the SNES. If any of the codes do not work, or if you know of any that do work that I did not mention please post about it in a comment below. If you are lucky enough to own a Game Genie you can use the below codes in Fire Emblem Seisen No Keifu snes cheats on the SNES. If any of the codes do not work, or if you know of any that do work that I did not mention please post about it in a comment below. If you are playing Fire Emblem Seisen No Keifu on Snes9x (Or another SNES emulator which supports cheat codes) there are a ton of cheat codes you can use. You can basically use any of the codes listed under the Action replay codes + Game Genie Codes sections, you simply need to enter the required code as per below. Question : Can I use all of these Fire Emblem Seisen No Keifu snes cheats SNES Cheats? Answer : The cheats I have listed under “Normal Fire Emblem Seisen No Keifu cheats (SNES) Cheats” can be used by everyone. You will need a Action Replay or Game Genie to use the cheats listed on this page. Question : Do the Fire Emblem Seisen No Keifu snes cheats Cheat Codes Only Work In The Snes9x Emulator? Question : I know a good cheat for Fire Emblem Seisen No Keifu snes cheats that is no listed on this page, Can you add it. Question : Do you have any gameshark pro codes for Fire Emblem Seisen No Keifu snes cheats? I hope this article on Fire Emblem Seisen No Keifu Cheats + Action Replay / Game Genie Codes has helped you. If you are aware of any tips I have missed off please post about them in a comment below. Please help us out by spreading the word and sharing this article on Fire Emblem Seisen No Keifu snes cheats (SNES) Cheats + Action Replay below.